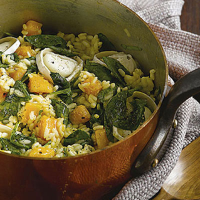 Delicious and filling, this sweet and creamy squash risotto makes a satisfying autumn supper. Heat the oil in a deep pan, then add the onion and sauté for 4-5 minutes until slightly softened. Add the squash and continue cooking for a further 4-5 minutes until it starts to colour. Add two-thirds of the stock, then cover and simmer for about 10 minutes until the squash starts to soften. Stir in the rice and continue to simmer gently for about 20 minutes. When the liquid has been absorbed, add the remaining stock. Stir occasionally until the rice is tender and the liquid is almost absorbed. Remove from the heat, season to taste then stir in the spinach, cover and allow it to cook in the residual heat. Place the goat's cheese slices over the surface of the risotto. Cover again and leave for a further 1-2 minutes to allow the cheese to melt a little. Drizzle a little extra virgin olive oil over each portion and season with black pepper. Serve with warmed ciabatta bread. To test whether the rice is cooked, take a single grain between your fingertips and press together. If it is completely soft then it is cooked; if there is any hardness in the centre it requires further cooking. Blue cheese, such as Gorgonzola, also works well with this recipe. This sweet and creamy dish will taste wonderful with a light and aromatic dry white. This recipe was first published in November 2006.